Scale, proportion, and quantity belong to one of the cross cutting concepts in the next generation science standards (NGSS). According to Volume 2 of the NGSS, "in engineering, no structure could be conceived much less constructed without the engineer's precise sense of scale." The authors go on to note that scale and proportion are best understood using the scientific practice of working with models. When scientists and engineers work with these concepts at a molecular scale, new kinds of technologies can be created to advance our understanding of the natural world. One example is DNA sequencing. DNA sequencing has become our most powerful tool for identifying anything of biological origin, whether it's food, plants, animals, viruses, bacteria, or genetic disease. As our use of DNA sequencing grows, the demand for more DNA sequencing continues to increase, creating pressure to sequence DNA at ever faster rates. Even though DNA sequencing has become a common technique, there is still room for improvement, especially in terms of the error rate. DNA molecules are too small (at least thin), to been seen with our eyes. Consequently, we must rely on technology to tell us what the sequence of bases must be. The current methods for determining a DNA sequence rely on mimicking the processes used in nature to replicate DNA and copy chromosomes before cells divide. The steps required to accomplish this task and the detection process itself can sometimes introduce artifacts that result in errors (see our posts here, here, and here for more details). Despite these challenges, we have learned to make reactions smaller and run them in massively parallel formats to make sequencing very fast and cheap. But, still not fast or accurate enough ... What if we could, instead, directly read a DNA sequence by passing it through a tiny hole that could somehow recognize the shape of each base as it passes by? Such a direct method for reading a sequence could be faster and more accurate than current approaches. Molecular structures and models helped scientists realize that this approach might work. In fact, these models and the research they inspired led to the first commercial systems for nanopore sequencing. 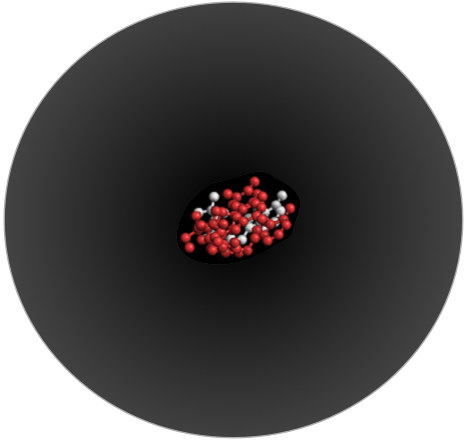 Using Molecule World™ we can examine the structures of these nanopores and learn about some of their properties. Nanopore sequencing methods were not easy to develop. The first commercial system for nanopore sequencing ( Oxford Nanopore Technologies Ltd ) required 20 years of scientific trial and error. The greatest challenge in getting this technology to work is that DNA is small and nanopores, while sounding small, are really big relative to DNA. A common method for creating a nanopore involves using lasers to drill holes in silicon wafers. These holes are commonly 10 nm (0.000010 mm) in diameter and about 10 nm deep. Double stranded DNA (dsDNA) is only 2 nm in diameter, and single stranded DNA (ssDNA) is only 1 nm in diameter. Since the holes are wider, the DNA can pass through one of these nanopores without touching the sides. Since the holes are short, only 30 bases of DNA can fit in a hole at a time. The diameter and depth make the holes too deep and too wide to detect and distinguish between DNA bases as they pass through the pore. The first problem that needed to be solved in getting nanopore sequencing to work was to figure out how to make smaller holes. 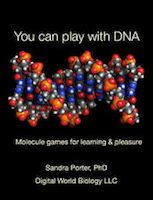 For a long time scientists knew that DNA gets in and out of cells. They reasoned that special proteins must exist that would transport DNA across cell membranes. And, they do. These proteins can be used as an alternative to the nanopores in silicon. The first protein to be tried was α-hemolysin (aHLA). With this protein, the pore size is closer to the diameter of DNA. Since the DNA makes contact with the sides of the pore, different bases can be detected. Alpha-hemolysin. From left to right: end view (ball and stick rendering) with DNA molecule, vertical structure in charge coloring (ball and stick rendering), vertical structure in residue coloring (tube rendering), and vertical structure in molecular coloring (space fill rendering). Even though DNA can pass through nano pores of alpha-hemolysin, the shape of still presents certain challenges with respect to how DNA moves through the pore. This has led scientists to experiment with other naturally occurring pore proteins such as Mycobacterium smegmatis porin A (MspA). Inspecting the structures shows how their shapes differ, with MspA having a broader base. When MspA's residues are colored by charge (negatively charged amino acids are shown in red, positively charged in blue and neutral in gray) we can see that the native MspA protein might not let a negatively changed molecule like DNA pass through (see if you can see why). Indeed this was the case, and the MspA being tested in nanopores is a variant where three of the negatively charged aspartic acid residues have been changed to neutral asparagine residues. MspA. From left to right: end view (ball and stick rendering), vertical structure in charge coloring (ball and stick rendering), vertical structure in residue coloring (tube rendering), and vertical structure in molecular coloring (space fill rendering). The eight base pair DNA fragment shown above the structure on the right is provided for perspective. When molecular models are represented in their proper relative scales, we can better understand the underlying scientific principles and learn how technologies may or may not work. Visually examining molecular details can also give us clues about ways to improve a structure's properties. We can later test our ideas through scientific experiments. In addition to understanding nature, we can also appreciate it's beauty. A really neat aspect of some molecular structures, formed from repeating protein chains, is how their symmetry creates art. Both aHLA, and MspA, show clear patterns of organization with respect to charge and position of the amino acids. Further reading: Nanopore sequencing - Wikipedia - contains the references to the articles used in this post. The MspA (MMDB:26671, PDB:1UUN) and aHla (MMDB:91767, PDB:3ANZ) structures were obtained from the MMDB database webpage. The PDB file corresponding to the biological unit was opened directly into Molecule World on the iPad. NGSS Lead States. 2013. Next Generation Science Standards: For States, By States. Washington, DC: The National Academies Press.